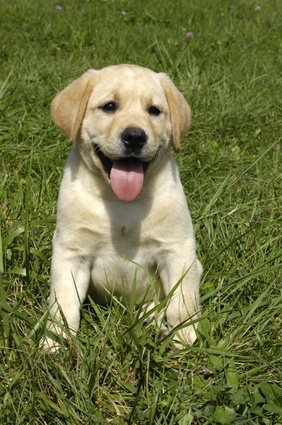 Needless to say, Labrador retriever puppy training the most important part is house training. A dog which isn’t house trained obviously doesn’t make the best of companions so, for your life together to be one of sweetness and light, you and your puppy need to indulge in a little house training. The thing that makes the whole process quite easy is that dogs, unlike many humans, are instinctively very clean animals. Your Labrador puppy will do everything it can to avoid soiling the area where he eats and sleeps and he will also want to get into a habit of going to the toilet in the same place. Naturally this special place needs to be outdoors! A very important part of house training your Labrador puppy is to set him up a special toilet area. Don’t let him choose it or you’re likely to see your favourite flowerbed decimated! Obviously the area you choose needs to be very accessible for the puppy and you should accompany your lab every time until he gets in the routine of visiting his special place. A simple command always helps when Labrador Retriever puppy training and the one I use is “better go now”. If you repeat the command every time the puppy goes to the toilet then he will soon get the message. To help the process ensure the puppy is always fed at the same time so this creates a regular schedule for him to go to the toilet. After he has finished his food; take him to his special place and repeat your command. You will be amazed how quickly he will pick up what he is supposed to be doing. Eventually you will just need to open the door, say “better go now” and he’ll trot happily off to his special place. Everyone’s happy. House training your puppy in this way is very beneficial in other ways. If you are preparing for a long trip together or simply hopping on the bus to the shops to be able to tell your puppy to go to the toilet before you set off can save a lot of embarrassment later.